Largely on account of its isolation, Hauna village and the Wokoma area of the Sepik Valley have suffered from benign neglect. Consequently the 3,000 people (approximately) who live in Hauna and the surrounding villages are facing big financial difficulties now and will face even more in the next ten years as the population rate is now increasing much faster than in the last ten years. There are simply insufficient funds to meet children's school fees and other expenses and this means that most people of this area suffer considerable hardship to survive. However, the strong and growing demand for rice provides good economic opportunities for individual farmers, as well as for the community as a whole, to become more self-reliant in food production and income. They own a very large area (well over 1,000 ha) of largely unused native jungle and swamp land bordering the river in Sepik Valley. 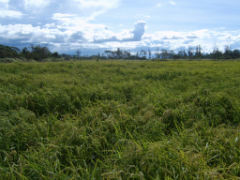 All the landowners agreed that this land was very suitable for growing rice since it is fertile and could be utilised for the best economic interests of this isolated rural community. 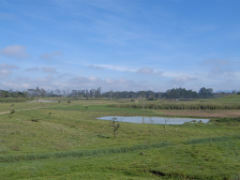 In the first year the plan is to establish at least 4 hectares of rice paddies. Practical training and demonstrations will be conducted and the local people will be educated in rice growing techniques. A rice mill will also be purchased so once the farmers have harvested their rice it can be milled and packed ready to be sold. The mill will be operated by Hauna-Wokoma Rice Company Ltd, a new company that will be established which will be a community-owned and operated business. It will process farmers' rice for their own consumption as well as purchase paddy rice from the farmers at fair prices, process and sell the rice to existing community stores. Any profits made will be put back into community projects. In 1992 the Sepik Christian Ministry (SCM) was set up to help educate Sepik children aged 3-12 years at preschool to prepare them for elementary level learning. Their aim was to improve the quality of life of Hauna and Sepik people through education and these aims have largely materialised. Currently they have 93 village workers, operate health care facilities, workshops and educate more than 300-400 children a year. However they are now facing issues of insufficient revenue to cover their costs as expenses have been rising while income has been falling. They therefore started discussing the option of setting up agricultural projects to help the people in a number of ways. It was proposed that such projects would achieve their aims by helping the people with food, employment and income, as well as sustaining the educational programmes' financial needs. In particular, such community work would enable the people to improve their diet and income by generating money to support themselves rather than relying on overseas donors' money. Lawrence Williams has had a long association with PNG, in particular the Christian Leaders Training Centre where he taught agriculture for a number of years and was involved in training people to grow rice. He is now based in New Zealand but visits PNG regularly. He has been very involved with Reuben Meiyao in developing this project and contacted BHW about the opportunity to partner with these people. The project beneficiaries will be all the people of Hauna and surrounding villages that will do rice farming. There will be no discrimination as to who can participate. This project has been initiated by the local community. They are so isolated but are keen to improve their standard of living and are committed to this project. There has been a lot of thought and planning go into this proposal by SCM and a committee has been established. Reuben Meiyao is not only extremely well qualified to oversee the project but also is from this community so speaks the local langauge and knows the environment in which these people live. Reuben grew up in Hauna and received training in agriculture at the Christian Leaders Training College (CLTC) in the Western Highlands district of PNG. In 1982 he attained his Certificate in Agriculture and after working in various capacities returned to CLTC as a farm manager n 1984. For some 25 years since attaining his certificate Reuben had increasingly wanted to put something back into his home village, this poor, isolated, distant and needy community. He realised that the people are very poor with little to no means of regular income, subsistence farmers by necessity; that they are in a desperate condition. Being rice manager at CLTC, with responsibility for the production and sale of at least 20 tonnes of rice per year from CLTC's Rice Growing Training Programme farm, Reuben has the knowledge, experience and insight necessary to oversee this project. Julius is a prominent leader in the Hauna community and is Chairman of the 12-person HREDP Committee, which represents all Hauna groups in overseeing the programme. Vincent is the Programme Manager in Hauna. He is responsible for achieving the stated goals and objectives of the programme. Lawrence is an agriculturalist who since 1972 has worked in agriculture in 18 countries in SE Asia, starting with Papua New Guinea. Now in New Zealand, he is adviser for the programme and a fundraiser for it. 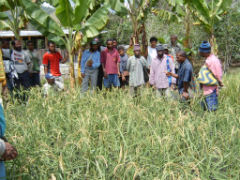 The whole village has been involved in the discussion and decision to proceed with and to plan this rice growing project. In villages in PNG nothing is done secretly and the community has been fully involved in all the discussions, both formally and informally. Because it involves using people's land there has been much discussion in the village. This project requires a one-off amount of NZ$8,000 to purchase and install the rice mill and will then be self-sustainable.